For the last six months I’ve been having the delightful experience of discovering a new favourite author. Lois McMaster Bujold isn’t a household name like Diana Gabaldon, or JK Rowling, or Charlaine Harris, or even Ursula K Le Guin. But I think she should be. Bujold has been famous for about 30 years in the science fiction world. She’s the award-winning author of something like 30 terrific novels and novellas in the science fiction and fantasy genres. (Her field is also called “speculative fiction.”) She’s won four Hugo Best Novel awards (equalling Robert A Heinlein’s record) and many other prizes. She has so much genre credibility that there’s no question of thinking of her as a guilty girly pleasure. Her novels have absolutely everything I love in a book: great ideas, swashbuckling adventure, and wonderful characters who I’m happy to spend many hours with. There’s a good dash of romance too. 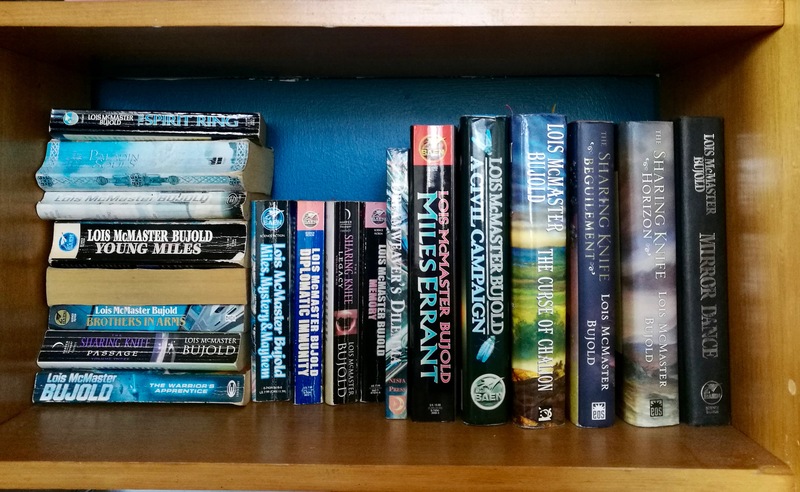 Six months of happy reading: this isn’t everything Lois McMaster Bujold has written, but it’s a good start. The main reason you haven’t yet heard of Lois McMaster Bujold is that her novels would be very difficult to turn into a blockbuster film or TV series. There are just too many ideas. Streamlining them into a TV drama would strip out far too much of what makes them so special. But the major factor is that the hero of Bujold’s Vorkosigan saga, Miles Vorkosigan, is physically impaired. Think Game of Thrones or Outlander, with Tyrion Lannister as the principal character. My route to fandom has been long and roundabout. A couple of friends whose taste in literature I highly respect have been raving for years about the merits of Lois McMaster Bujold. Thankyou, David Larsen, and thankyou, Meliors Simms! I’ve been a reader of science fiction and fantasy since falling for Lord of the Rings at the age of nine (thanks to my ten-year-old friend, Janet Buick). But I’m fussy about what I read – I need to bond with the characters, to want to spend time with them. It’s a mixture of falling in love and meeting new best friends. JK Rowling, Diana Gabaldon, Katharine Kerr and Charlaine Harris all write loveable characters. Ursula Le Guin and Julian May not so much, but I’ve stayed with their series because of the adventure and the ideas. Two out of three is okay. But, as I’ve said, Lois McMaster Bujold has all three in spades. Bujold’s writing mostly fits into three series: the World of the Five Gods series, of which The Curse of Chalion is best known; the Sharing Knife series; and the Vorkosigan saga, which is a “space opera” of 16 novels and assorted novellas and shorter pieces following members of the Vorkosigan family across time and space. I found my way into Bujold’s universe in a typically roundabout way. I have a perverse track record in starting series halfway through. I started CS Lewis’s Narnia series with Voyage of the Dawn Treader. The first Outlander novel I read was A Breath of Snow and Ashes. I think I started Julian May’s Galactic Milieu series with Diamond Mask. I found my way into Katharine Kerr’s Deverry novels with A Time of Justice – although since Kerr wrote the series as a Celtic knot, that didn’t matter so much. I read Lord of the Rings without ever reading The Hobbit. The next Bujold novel I encountered was The Curse of Chalion. It’s a superb fantasy story with absolutely everything I could possibly want (except dragons or unicorns): brave and flawed heroes, clever and feisty heroines, evil villains, supernatural intervention, adventure, and a happy ending. Soon after that it was Christmas, and I spent several hours lying on a Dunedin motel bed devouring Brothers in Arms, which falls somewhere in the middle of the Vorkosigan saga. Amidst the fast moving adventure and political intrigue, I found myself laughing out loud. The narrative twisted and turned into a hilarious twin comedy/drama of mistaken identity, and then into a story about how children don’t have to grow up to be as crazy as their parents. I was hooked. As soon as I got home, I rushed to my friend Meliors’s house and demanded to borrow all the books off her bookshelf. My favourites are still The Curse of Chalion (although I’m also very fond of the sequel, Paladin of Souls) and Brothers in Arms. Miles is like one of those friends who are so entertaining and inspiring, and so much larger than life, that you’re quite glad you don’t have to live with them all the time. Part of me identifies with him (his life challenges include two parents who are hard acts to follow) and partly I find him seriously annoying – which is a fairly typical response from other characters in Miles’s life. Miles is dynamic and hyperactive. He takes his circumstances and his limitations and he makes things happen by taking audacious action. The high point of Miles’s career as an intergalactic spy and mercenary is in the novella The Borders of Infinity, in which he manages to free an entire penal colony of political prisoners. Miles’s comic foil (and often, the reader’s light relief) is his laissez-faire cousin, Ivan. Blessed by good looks and healthy physique (but raised by a hyper-vigilant solo mother after his father was assassinated), Ivan avoids taking action at all costs, and things just happen to him. Bujold’s writing is full of great female characters of all ages, from action heroines to mother figures and plenty in between. The main heroine of the Vorkosigan saga is both an action heroine and a mother! Cordelia Naismith, Miles’s mother, is a scientist from the high-tech, egalitarian planet Beta. She falls for Aral Vorkosigan, an aristocrat from Barrayar, a world with a hierarchical, militaristic culture. The Vorkosigan novels are quite varied in pace and style. Some are non-stop action-adventure; others (e.g. A Civil Campaign) could be described as melodramas or comedies of manners. My least favourite (currently) is Mirror Dance, which won both the Hugo and Locus awards in 1995. It’s a gripping novel, but it features too many painful turning points for several characters – I don’t want to re-read it. Like most people, I love to justify my actions with rational explanations. I freely admit that reading fiction is a major escapist activity for me. However, I’ve also found that fiction is much more than entertainment or distraction. Good storytelling is about exploring and playing with ideas. My thinking in many areas has been shifted by reading science fiction and fantasy. The “truth or fiction” distinctions are blurring in current media, with “fake news” and reality TV, and dramas such as The Crown and Suits, sitting alongside news coverage of the real time marriage of Prince Harry and Meghan Markle. Nothing is ever “just a story”. Of all Lois McMaster Bujold’s novels, the one that could be most easily turned into a film is Ethan of Athos. It’s a funny, clever tale that reverses the sci-fi trope of a “planet of women”. Dr Ethan Urquhart is a doctor from an all-male planet, who is sent on his first trip into space and encounters women for the first time. It would make a great, light relief counterpart to The Handmaid’s Tale. One of my life regrets is that I don’t have the talent or inclination to write fantasy or science fiction. I’m grateful to Lois McMaster Bujold (and others) for doing it for me. Thanks, Lois! I look forward to reading whatever you come up with next.